More than 1.2 billion people worldwide live without access to electricity. Imagine one in seven of your friends and family being unable to boot-up, log-on or recharge! But way more than inconvenience, the harm caused by living with little or no energy is very real, impacting health (people burn harmful fossil or bio-fuels indoors for heat, light and cooking), education (no energy at home means no light for studies, no ability to do research on the ‘Net), even safety at night (for people, possessions or livestock). 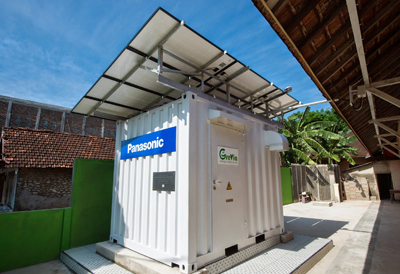 Power Supply Stations can do the real heaving lifting in off-grid communities. 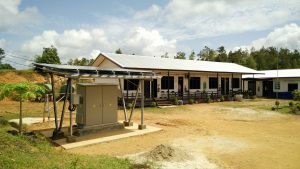 It may be a bit unusual for a leading consumer electronics company to show interest in regions without power, but companies like Panasonic are among those helping to lessen the challenges faced by people living in off-grid areas by donating rechargeable lighting devices, solar generation products and even power storage systems. Panasonic’s Off-grid Solutions Project provides not only products but the training and education that’s needed to build a technical understanding of electricity, along with an appreciation of how to harness its ability to increase local income and support independence in affected communities. 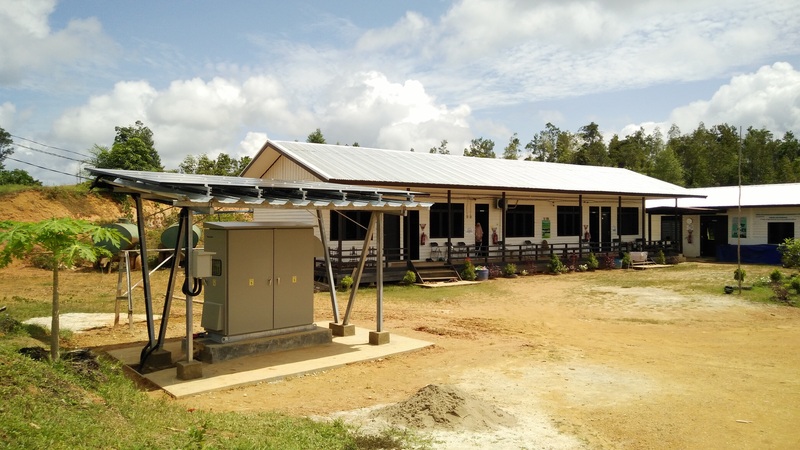 Stand-alone photovoltaic power packages are used in Indonesia as a power source for water purification system. Panasonic has donated the Power Supply Stations. The project is focused on communities in Asia and Africa with large off-grid populations. 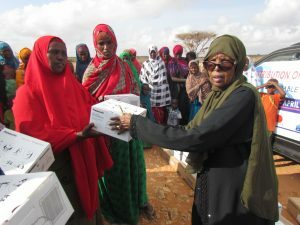 Starting in Indonesia (January 2018–December 2019), Myanmar (April 2018–March 2020) and Kenya (currently being coordinated), the tech support will be extended to other regions and countries where Panasonic will partner with various non-governmental and non-profit organizations (NGOs and NPOs) already working in those areas. Panasonic has donated stand-alone photovoltaic power packages its calls the Power Supply Station, compact energy storage systems with LED lighting, known as eneloop solar storage, and solar LED lanterns, among other products. The company reports it has donated 100,000 solar lanterns to 30 countries and 131 organizations/institutions, mainly in Africa and Asia, which are being used in homes, schools and community assembly halls. Each LED lantern puts out about 100 lumens of light (one of three brightness settings); it’s said to operate up to 90 hours. Solar LED lanterns double as a charger for those living in areas without electricity. The solar lantern doubles as a charger, thanks to a 3.5W solar photovoltaic panel that comes with it. The lantern is fully charged in about six hours; with its built-in rechargeable battery, the lantern can also store solar energy, providing light at night and even getting power to other devices, like cell phones. The company’s eneloop solar storage system has more robust specs, with up to 500 lumen output, faster recharging and a expected life of more than 2,000 re-uses. But it is the stand-alone solar generating system called Power Supply Station that can do the real heaving lifting: it weighs more than 850 kg, but it can pump put more than three kilowatts of generated power, with an AC output capacity of more than three kilo volt amperes. That’s enough to be seen as part of the future of small-scale industrial activity: farm- and fish-processing businesses in under-powered regions can thrive on energy from solar panels and storage systems, while also creating micro-businesses that provide battery replacements and systems maintenance. The 100 Thousand Solar Lanterns Project donated 102,716 solar lanterns to 30 countries and 131 organizations/institutions of regions mainly in Africa and Asia. These benefits are among those described as SDGs, or Sustainable Development Goals, by the United Nations. There are 17 goals and well over 150 specific targets to be reached by 2030. While programs such as Panasonic’s project are making huge inroads in those faraway regions where we might expect power to be scarce or even unavailable, like Nepal or Myanmar or Cambodia, it should be with some surprise if not embarrassment that the sustainable development targets could be here in Canada. That’s because Canada has more than 200 Indigenous communities not connected to an electricity grid (they rely on diesel to keep the power on). But under terms of a new agreement between Ontario First Nations, the federal government and the province, 16 northern communities will be connected to the power grid as part of a $1.6-billion project expected to completed by 2023. It’s a long time for the 14,000 residents of the communities in the Pikangikum First Nation, for example, to keep waiting for a connection to the provincial power grid. When they finally are able to “give thanks for the light” (part of an evocative and telling prayer attributed to Tecumseh, the Shawnee chief and aboriginal leader who fought – and died – defending Canada from American encroachment in the War of 1812), they may well wonder what took so long, and if workable technological alternatives being deployed elsewhere could work here. Panasonic’s solar lanterns are being used in community clinics and for home study in villages without electricity in Cambodia. All photos provided by Panasonic Corporation.